A HIGH profile figure is to help lead the campaign against a proposed 109-mile chain of electricity pylons spanning the region. Dame Barbara Kelly CBE, DL, LLD has been announced as president of the south west Scotland campaign group DumGal Against Pylons. Taking on the new role, Dame Barbara said: “I am deeply concerned that this is not just about the impact of a new transmission line, major intrusion though it will be. 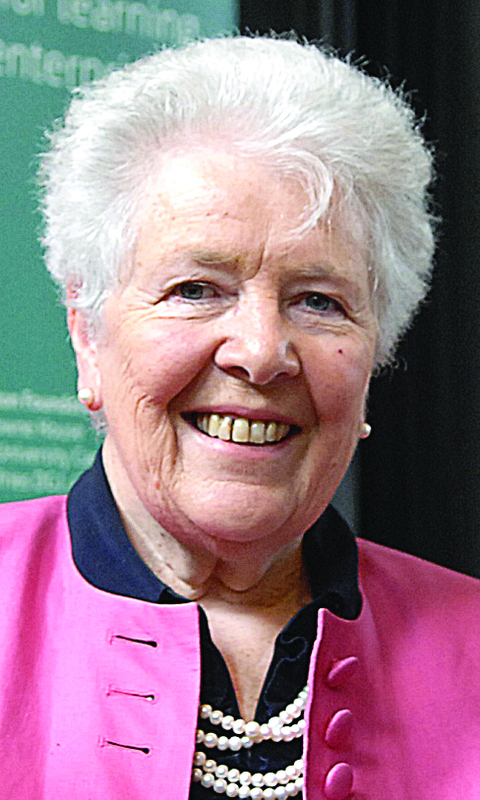 Dame Barbara is an advocate for social justice, and as an active member in her family’s Dumfriesshire farming business is described as deeply committed to the well-being of rural Scotland. SP Energy Networks (SPEN) argue it is necessary to modernise and upgrade the region’s ageing and undersized electricity transmission network, replacing a 130km chain of existing pylons with larger structures able to carry 400,000 volts. DumGal Against Pylons have responded to the initial proposal with an alternative plan which they believe meets the need to transmit renewable energy generated in the region to England and Wales, without the same degree of damage SPENs proposal will cause. The alternative includes utilising a sub-sea cable to transmit the majority of the generated energy out of the region from Newton Stewart westward and retaining an uprated 132kV network following much of the existing route. SPEN are preparing to publish feedback from their first consultation focused on the project, after receiving 1600 responses, having extended the consultation period by five weeks.